We've all heard of the saying "the customer is always right" but when you work in service industries, what can you do to vent your frustration when the customer is rather annoying? Whether it's children running riot, requests for the most obscure information, or just plain rude customers, Australian bookshop worker Anne Barnetson has faced it all. But she's come up with a rather novel way of dealing with such awkward situations. "It's unenacted fantasies that I think people have after a very long day when they think: 'It would just be great to stop all this right now,'" laughs Anne, who lives and works in Perth, Western Australia. She is, however, keen to stress that she's a lot more polite in real life and the interactions shown are very much exaggerated. This is a bit of a relief as one of the more icky comics shows a creature seeking a (made up as far as we can tell) book called Chicken Soup for the Soul: Urine Therapy for Tweens, second edition. 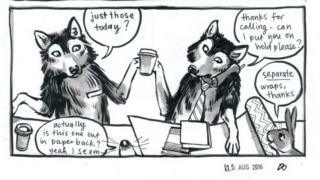 The wolf worker's reaction is one of sheer unadulterated horror. Anne says: "The idea came about when I was working at a bookstore with a good friend and we had nicknames for each other. I was 'Flying Wolf' and she was 'Black Wolf'. She said: 'Wouldn't it be funny if savage predators worked in retail and they could just eat the customers that really irritated them?'" 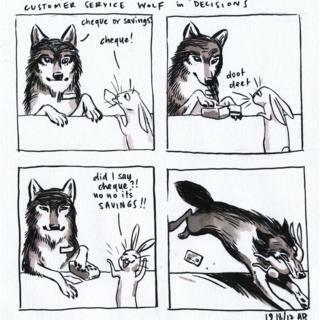 She drew the first strip for her friend in 2012 - an interaction between a wolf worker and an indecisive rabbit - but soon realised that she had a whole hoard of experiences to unleash upon the world. Anne says it's far safer to draw the characters as animals. "It gave me free rein to be as humorous and rude as I liked about the interactions I've had with my customers. I'd hate to actually upset anyone." "Dr Fox is always happy when he sees himself. Manager Wolf is another repeat character. You can pick him out because he wears a tie, which my boss used to find hilarious. He didn't wear a tie, but still it's about representing middle management." 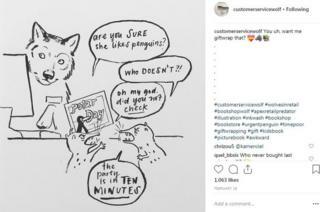 Anne hasn't revealed which bookshops she works in, although she is now starting to get recognition because of the comic strip. "Thank goodness no-one has pointed out themselves and said: 'Oh, I'm going to sue for defamation or anything,'" she says. People who comment on her strips often share their own experiences. "On my first shift in a bookstore, a lady asked for an orange book but she couldn't remember the title. Or summary. Just 'big orange book'," says one fellow bookshop worker. "My favourite record store repeat request. 'You know that love song they're always playing on the radio. You must know it. They play it all the time,'" another reader comments. "I've found that if you're in customer service, people can be a little condescending or just assume you don't have feelings or will be very impatient. The ones that still make me feel horrible when I think about them are those where I've been properly yelled at, usually by a man. "I am definitely not as quick as the wolf. I stumble, get quite awkward, and then fume about it for hours, days and weeks afterwards. 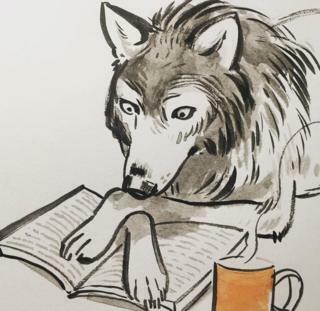 "That's what's so nice about living out the fantasy in the wolf comics - they are completely instinctual, specialised animals that are quick to act and they don't think about it. "But of course, being human is much more awkward, complicated and difficult."